In anticipation of his presentation at eMetrics Summit in New York City, October 23-27, 2016, we asked Andrew Goodman, President of Page Zero Media, a few questions about digital marketing analytics. 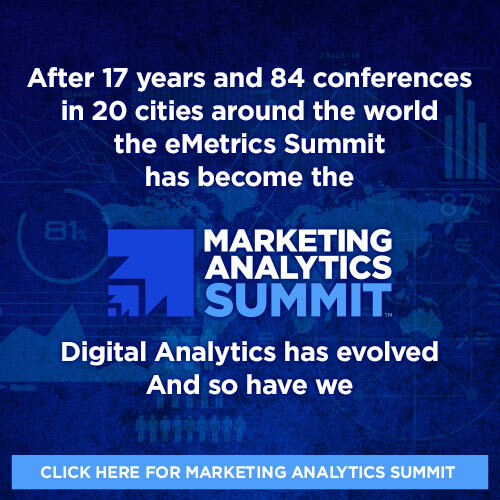 Check out Andrew’s interview in relation to his eMetrics Summit presentation entitled, What *Shouldn’t* PPC Managers Be Managing? Andrew: It sounds cliché given the many years of buildup around the importance of mobile, but a massive change in behavior has come about in the past 18 months. Consumers are coming close to being equally willing to transact e-commerce purchases, even multi-stage processes, through their smartphones; i.e. the conversion rates aren’t just “acceptable,” they’re nearly identical to larger devices. Given the fact that we’re now satisfying consumers at the level of basic functionality, won’t it be interesting to see how consumers adopt more proactive applications that will literally “do their shopping” for them based on a few directives via voice search? Not everything wants or needs to come to your door in a box. But we should, therefore, expect ongoing change in how retail spaces and logistics work, so that consumers could pick up their purchases at retail locations without going through a whole song and dance. As things stand now, I’d characterize “in-store pickup from online purchase” at, say, Best Buy, as still “going through a whole song and dance.” I think they still try to sell you the extra warranty when you show up in store. Arggh! You tell ’em, John Pinette! It’s worth asking: will the big brick-and-mortar retailers (such as grocery stores) adapt to this world, or is it going to take technology pure plays — perhaps even massive investments in new ones — to grab the consumer’s attention with regard to minimizing the effort to create recurring purchase lists available for pickup with virtually no annoying interactions with pesky humans? Andrew: The Google Display Network. Much of the Display world generally forces substandard, remnant, or fraudulent publishers down the advertiser’s throat if they want access to cool targeting or reach. Someone needs to come in like Eliot Ness and clean up this town. I nominate Microsoft for the task, since they’re the only credible check on the current power of Google and Facebook. I’ll listen if someone has a better idea. 1. Looking at too many non-actionable analytics that lead to make-work reports and meetings about secondary topics. It is of course useful and interesting to explore the texture of a business beyond primary KPI’s, but you can usually tell if someone is crossing a line into mystery meat metrics. People who have an advanced background in the financial markets or baseball statistics seem to be relatively immune to such folly. Looking backwards at data you can always identify segments (even tiny ones, like low-volume keywords, or Tuesday between 4 a.m. and 8 a.m.; or in the case of baseball, who was the “streakiest hitter” that year, or who hit best with runners in scoring position) that happened to underperform or outperform that week or month. It’s inevitable that a couple of laggards will finish at the bottom of any list, but is their presence at the bottom of the list meaningful or persistent? Chasing random numbers, rather than meaningful patterns, would of course be busywork at best, and counterproductive at worst. We absolutely do have the ability to constantly move in the direction of more efficiency in campaign details, but it’s impossible to weed out all “waste” in advertising. We don’t have a crystal ball as to what will happen once someone interacts with our message. The environment is predictive, but fallible. We’re making the best possible bets we can, and iterating to new information. That’s it. Speaking of iterating to new information, that’s a quality of Super Forecasters, in the book Superforecasting by Gardner and Tetlock — another excellent resource. Andrew: In addition to books like those above, I’ve always enjoyed Avinash Kaushik’s writings. Otherwise, I tend to focus on statisticians and analysis from fields other than marketing: baseball, public policy, financial/market analysis. My academic background was in Political Science. The key, in anything, would be to guard against any pseudo-science proffered by what Nassim Taleb is only too happy to refer to as “charlatans.” The demise of large hedge fund Long Term Capital Management in 1991 was swift and sudden, despite its founders having won Nobel Prizes in economics. Of course, in our field, it’s important to stay in touch with all the specifics of online user behavior, so anything that refers to testing and user behavior in any way counts as insightful. Some of the seminars given by, for example, the Nielsen Norman group on the data foundations behind UX conventions — these provide in-depth, critical insights. Navigation principles can be invented and reinvented, but they may well come back to broader behavioral/brain phenomena such as cognitive load, mental models, etc. Andrew: A couple of things. First, the complexity and power of platforms like AdWords, Bing, and Facebook just continues to grow. So experienced account leads are a must not only to push a few buttons, but to have insight into strategic direction and to be able to knit it all together coherently. Some of that exciting new power will come in the form of new bidding options made available by Google. Demographics (age, gender, parental status) are currently available for maybe 75% of Display Network users, but not at all for Search… until very recently. Gaining control over that, along with device specifics and geography, gives us a lot to optimize with. Following from that, you need to automate more. We love our third-party optimization and automation partners (such as Optmyzr and Acquisio), but to be consistent with our own personal obsessions in areas I feel strongly about, we’re now building our own set of tools and algorithms, so our account managers can have the option to customize and manage hands-on while allowing the bot to work to scale. The tool (manages aspects of accounts via the AdWords API; currently in the early stages of development, with just a couple of working parts) is called Zerobot. It’s proprietary. We have no near-term plans to commercialize the product beyond its benefit to clients. Andrew: What PPC account managers should stop doing hands-on, manually, if they want to maintain their sanity. As a result, what the resulting toolsets need to address — most of this is not currently available, but some of it is. Once that elephant in the room has been addressed, though, we need to have a serious talk about what experienced account managers bring to the table. These are pivotal, high-value roles that have only become more necessary as the complexity of the field grows. I don’t think you’re going to drive a company to profitability by just pushing a button. Don’t miss Andrews’s presentation, What *Shouldn’t* PPC Managers Be Managing? at eMetrics Summit in New York City, October 23-27, 2016. Click here to register for attendance.